You can resize images with various methods. This can be done through styles or by using local formatting. Using styles is usually recommended because the setting is automatically applied to any content using that style throughout the project, whereas local formatting affects only the particular content that you are working on. Following are the tasks you can perform. Resize with Styles You can resize many images at once by using the img style in the Stylesheet Editor. Not only can you select a specific image size, but you can also set a maximum or minimum height or width. You can set either the width or height on the image tag and let Flare set the other property automatically, maintaining the aspect ratio (i.e., size proportion of the image). Using this method, you can take advantage of single-sourcing by also using a print medium in the stylesheet. Simply specify one group of settings for the medium used for the online output, and use another group of settings for the medium used for print-based output. See About Mediums and Media Queries. Resize Locally Using Properties You can resize an image locally by setting its height and width properties, including maximum or minimum height or width. This is similar to the styles method, except that the properties are set only for a specific image, not on a style that can be applied to many images. This method also lets you take advantage of single-sourcing, because there is one group of settings that can be used for online output and another for print-based output (based on the medium that you are using for the target—e.g., default, print). Resize Locally Dragging the Icon You can resize an image locally by clicking and dragging the icon in the lower-right corner of the image. When you use this feature, Flare automatically sets the new height and width on the image tag. Reset Size If you resize an image and then decide you want it to be its original size (even after you save your work), you can easily reset it. From the Medium drop-down in the Stylesheet Editor, make sure the proper medium is selected before you begin. In the Advanced view, you can open multiple mediums at once; you just need to look at the title at the top of the medium pane and make sure you are working in the correct one. 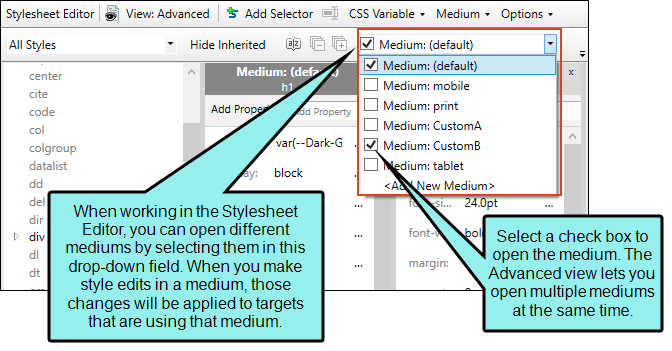 If you are not using stylesheet mediums for your different outputs or if you want all mediums to have the same settings, just leave the medium set to default and continue. Mediums can be used if you want to use one group of settings for online output types and another group of settings for print-based output types. For example, you might use the default medium for your online outputs and the print medium for your print outputs. See About Mediums and Media Queries. Please note that Flare remembers the last medium that you used when working in the stylesheet, so it may or may not be the one that you want to use the next time around. In the upper-left corner of the editor, click in the drop-down field and select . From the area below, select the img tag. If you created classes of the tag, you can expand the img style and select the class instead. Let's say that you are creating a PDF manual that is 8 inches wide and you want to ensure that none of your largest images are wider than 6 inches. You can create a class of the img style and name it "MaxWidth6Inches." For most of your images, you can use the parent img style, but for the large ones, you can use the img.MaxWidth6Inches style class. The large images will automatically be resized if necessary so that they are no wider than 6 inches. You can use the following steps to specify a precise width or height for the style. You can also specify a maximum or minimum width or height. If you are using the group view, expand the Box group. To the right of height and/or width, click , and complete the fields in the popup. Enter a value in the lower-left area and choose from several different units of measurement (points, pixels, centimeters, etc.) in the lower-right area. Click OK when you are finished. If the original image is larger than the maximum width or height that is set, it will be reduced in size so that it is no greater than the maximum value. If the original image is smaller than the maximum width or height, it will not be resized. If you are using the grouped view, expand the Unclassified group. To the right of max-height and/or max-width, click , and complete the fields in the popup. Enter a value in the lower-left area and choose from several different units of measurement (points, pixels, centimeters, etc.) in the lower-right area. Click OK when you are finished. If the original image is smaller than the minimum width or height that is set, it will be enlarged so that it reaches the minimum value. If the original image is larger than the minimum width or height, it will not be resized. To the right of min-height and/or min-width, click , and complete the fields in the popup. Enter a value in the lower-left area and choose from several different units of measurement (points, pixels, centimeters, etc.) in the lower-right area. Click OK when finished. To apply a particular style class to an image (after you create it in the Stylesheet Editor), simply right-click the image where it is inserted. Then from the menu, select Style Class and choose the appropriate style. Open the content file (e.g., topic, snippet). From the context menu, select Image Properties. The Image Properties dialog opens. If you want to provide only one group of settings for the image, select the Size tab and complete the following steps. If you want to provide two groups of settings, use both the Size and Print Size tabs. First, select the Size tab and complete the following steps for targets that are using the default medium or a custom medium. Then, select the Print Size tab and complete the same steps for targets that are using the print medium. When you generate a target that is using the default or a custom medium (specified on the Advanced tab in the Target Editor), the settings on the Size tab will be used; when you generate a target that is using the print medium, the settings on the Print Size tab will be used. See Creating Mediums. In the Width and/or Height field of the Size section, provide the settings. First you need to select Length in the top drop-down list. You can then enter a value in the lower-left area and choose from several different units of measurement (points, pixels, centimeters, etc.) in the lower-right area. See About Units of Measurement. In the Width and/or Height field of the Minimum Size section, provide the settings. First you need to select Length in the top drop-down list. You can then enter a value in the lower-left area and choose from several different units of measurement (points, pixels, centimeters, etc.) in the lower-right area. See About Units of Measurement. In the Width and/or Height field of the Maximum Size section, provide the settings. First you need to select Length in the top drop-down list. You can then enter a value in the lower-left area and choose from several different units of measurement (points, pixels, centimeters, etc.) in the lower-right area. See About Units of Measurement. Hover over the image. An icon displays in the lower-right corner of the image. Click on the icon and drag your mouse either up and to the left (to reduce the size of the image) or down and to the right (to increase the size of the image). From the context menu, select Reset Size. The image returns to its original size. Note: You can also use show images as small thumbnails in the output (either by using styles or locally). End users can see the full size of the image by hovering over it or clicking it. See Showing Images as Thumbnails in Output. Note: When resizing objects, you can ensure the aspect ratio is maintained. For example, if you want certain objects to be resized so that each is exactly 3 inches high, you can make sure the width of each object is adjusted accordingly to stay in proportion. To do this, first set the height at 3 inches. You would not set the width property at all. In the same way, if you were to specify an exact width, you could maintain the aspect ratio by not setting the height. Note: Please be aware that if you are using percentage for the size of an object, the percentage refers to the block containing that object, not to the object itself. For example, if you have an object in a topic and set the width to 60%, this does not mean that the object will be reduced to 60% of its size. Instead, it means that the object will be resized so that its width is 60% of the "container" where it is inserted. Note: Starting with Flare 10, images with a very low DPI are rendered more accurately in the XML Editor (WYSIWYG) and PDF output, usually resulting in slightly larger and more blurry images (as is consistent with their lower DPI). Therefore, if you upgrade from an older version to Flare 10 or higher, you might notice images that looked a certain size before now look larger and more blurry (because their true DPI is being rendered more precisely). The best solution, and a long-term one, is to replace your lower-DPI images with higher-DPI images to be used in print output. But you also have the option to revert back to previous version behavior. See Matching the Image Resizing Behavior of Previous Versions.